In February 1994, the Hoover Institution held a conference on Congress, inviting more than two dozen scholars, journalists, and members of Congress to participate in an array of panel discussions. The conference asked, in effect, Is Congress working as it should? 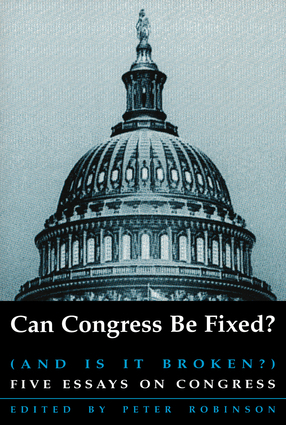 If no, how should Congress be reformed? Throughout these panel discussions, five writers noted the principal arguments put forward in each of the panel discussions, then composed essays on particular issues, drawing conclusions from the arguments and presenting their own views. An introduction provides a straightforward description of the conference. In commissioning these essays, the Hoover Institution was engaging in an experiment. The institution hoped that the essays would represent not only a record of the conference but also a provocative contribution to the debate on congressional reform.